Today’s Recreational Vehicles are equipped with ever growing features, amenities, accessories and luxuries. There’s very little on the “wish list” left to the buyers’ imagination. That’s good, but it can also get expensive, and it can run counter to some peoples’ philosophy that less can be more. 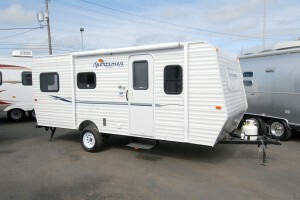 Enter K-Z RV, a Middlebury, Ind., manufacturer that’s added the new Sportsmen Classic line to its towable products (www.kz-rv.com). The Classic is a refreshing step back to basics for RVers with less in mind. To take a close look at a Classic, in this example a model 19SB, we stopped by the lot at George M. Sutton RV in Eugene, Ore., (www.suttonrv.com ) and enjoyed a walkthrough on a refreshing new RV concept. Many of today’s towable manufacturers are marketing “retro style” trailers that harkens back to a simpler time for RVing. The Classic series certainly fits that mold, and while the 19SB is just 20 feet 6 inches long overall, it’s still the largest model in the lineup. Buyers can choose a Classic 13FK that’s just 13’9″ long and weighs a mere 1,854 pounds Unloaded Vehicle Weight (UVW). The 19SB weighs 2,776 pounds UVW so it’s also towable by many downsized minivans, SUVs and small pickups, which means a buyer can use the family car instead of needing to buy a larger tow rig. There’s even a Classic toy hauler model, the 16FKTH that weighs just 2,271 pounds empty, so those with recreational toys to haul can also choose a Classic. Not only does the Classic’s light weight help in the cost-of-RVing area, in that its low weight means less fuel consumption on the road, but the price is also right. It has a $9,435 base price, a figure that, per usual RV sales practice, bumps up with assorted desirable option packages. The model we viewed was stickered at $14,009 total price. Given the usual trade-in or other discounts, even the $14k figure can be whittled down. Outside, the Classic is remarkably plain with white corrugated aluminum skin, bare-bones graphics and a lack of body adornments such as wheel well flares. For those who enjoy an uncluttered visual esthetic, this is it. Inexpensive but time-proven techniques are used to manufacture the Classic. Wood framing is sheathed with the corrugated aluminum skin, fiberglass insulation packs the structure and decorative wallboard covers the interior, including the 73-inch-tall ceiling. Interior treatments include simple but durable vinyl flooring, Formica-style counter and table tops and rugged, no-frills fabric and cabinetry. Old-style materials don’t mean poor quality as long as they’re well-assembled with care and attention to detail at the factory, and the K-Z crew excels in those areas. Inside, the 19SB floorplan includes a forward full-size bed, the shower/toilet enclosure streetside, a curbside galley and aft-end fixed dinette. A 4.6-cubic foot refrigerator and pantry storage unit are positioned streetside between the dinette and shower enclosure. I can only speak for my family, but what do we really need for RVing? At the most elemental level: a comfortable place to sleep, room for dressing, a means of avoiding a trip to the campground restroom in the middle of the night, a cooking facility and climate control. The Classic covers all those bases, and anything beyond those details, like a dinette table that doubles as a workspace and a functional shower, is a bonus. Its standard fluid capacities reflect the trailer’s casual-use design, with 20 gallons of freshwater and 15 gallons each grey and black water. With conservative use those capacities will do just fine, but long trips would call for more-frequent dumps and replenishment. The roughly 4.5-gallon propane capacity (optional) will handle the needs of the optional 16,000-Btu furnace and optional 6-gallon water heater unless extremely cold weather is encountered and calls for extended furnace use. Photos courtesy Jeff Johnston: With its minimal graphics and lack of non-essential adornments the Sportsmen Classic from K-Z is a fully-equipped trailer with comfortable livability in a cost-conscious package. 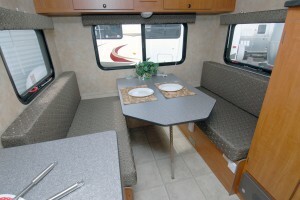 A full-size dinette, sized to fit four adults, occupies the aft end of the Classic 19SB. The dinette folds down into a bed that’s handy for the kids or when guests arrive. 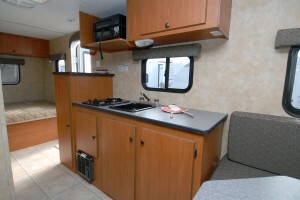 The Classic 19B galley has storage spaces, a two-burner stove, sink and roomy working counter areas. The refrigerator and storage pantry are conveniently located across the aisle. 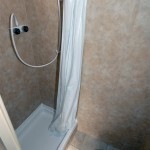 The shower/bath in the 19SB includes a large shower enclosure that’s bigger than you find in many larger RVs.